Two people push on a boulder to try to move it. The mass of the boulder is 825 kg. 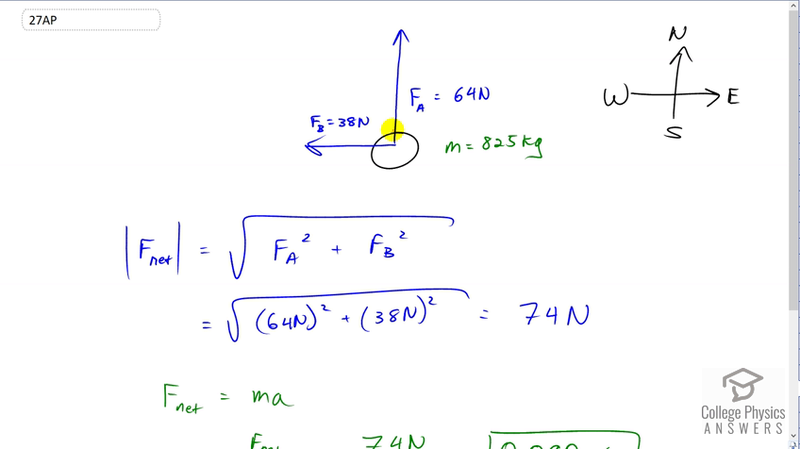 One person pushes north with a force of 64 N. The other pushes west with a force of 38 N. Predict the magnitude of the acceleration of the boulder. Assume that friction is negligible. This is College Physics Answers with Shaun Dychko. We're going to determine the acceleration of this boulder and the question is very convenient because it has given us two forces that are at right angles with each other. So they make up the x and y components of our net force. So, our net force is going to be the square root of this force squared, plus the other force squared, and that makes 74 Newtons. The net force is also mass times acceleration and so acceleration is the net force divided by m, 74 Newtons divided by the 825 kilograms gives an acceleration of 0.090 meters per second squared.